Ireland‘s premiere graffiti event, ‘Bridge Jam‘ will take place at the Bridge of Peace in Drogheda this coming weekend. The 18th annual graffiti jam (the world’s longest lasting graffiti event) will feature SOTEN, TIWS, RASK, CRAP, REKS, DAMN, BETA, SUMS, SCIE, PHATS, DEKS, CRACK, CHASE, AMPES, CREPT, VERA, KRIME and PACE to name but a few! Check out this gem from the vaults of Irish graffiti featuring members of the TDA crew, The Dark Angels, in 1997. The graffiti report from @last TV directed by scanarama’s donal scannell includes an old processing factory in Drogheda and gives an insight into the earlier days of Irish graf writers. Respect! Posted by Irish Street Art in International Street Art, Irish Graffiti. Ireland’s longest running graffiti crew, the TDA Klann (The Dark Angel’s) have come along way since their humble beginnings back in 1991. Since then they have become one of the most established of crews on the international stage. To celebrate twenty years in existence founding members hooked up with current members in London. Below are photos of the St. Patrick’s Day gig. For a more visit Montana-cans.com. LB Frames covers Cork‘s ‘Rattles the Most’ in HD at the beginning of the summer. Really nice footage and incredible graffiti from the pick of Ireland’s graffiti writers including the prolific RTM, TDA TDS and TNB crews. Check out White Street Car Park’s latest facelift in the doc below. Installment number 11 at ‘12 doors‘ comes from Sums. Sums, originally from Drogheda now residing in Dublin, has been actively part of the Graffiti scene since 1989 having played a major part in the growth of Graffiti here in Ireland. He also been co-organizer with ‘Bridge Over Troubled Water’ aka ‘The Bridge Jam‘ festival for the last 15 years, which is one if not the longest running graffiti festival in Europe if not the world. 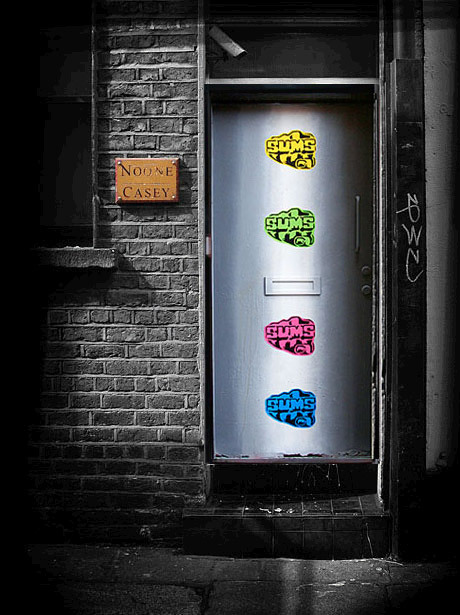 He has played a vital role in increasing awareness around the globe of the Irish Graffiti art scene.He has exhibited work in Ireland, England, Scotland, Sweden, Denmark, New York and as far way as Sydney, Melbourne, Adelaide – Australia. Today, Sums works for the leading post production facility in Dublin as a Flame Operator, composting special effects for commercials and film. He along side fellow artists run TDA KLANN, Ireland‘s longest running graffiti crew. TDA KLANN have been pioneers in producing some of the largest scale outdoor murals ever seen in Ireland. This year alone has seen Sums travel to Melbourne, Copenhagen, Scotland, New York in a bid to promote Irish graffiti and TDA KLANN. Rask of the TDA Klann tells IrishStreetArt.com the story of The Bridge Jam on the 15th birthday of Drogheda‘s international event. The photos below were all taken at this year’s momentus jam. “I began thinking about running an event in Ireland after attending a jam in Scotland back in 1992 run by my mate eez. The concept was simple to make international artists aware there was a scene in Ireland and invite artists across so we could learn from and collaborate with them. Eventually this would all help to grow the then fledgling scene. I managed to secure the permission to paint the bridge in 1993 and that same year we painted what was simply a mural using spray paint to start things off. This was well received so in 1994 with the help of my friend eez from Scotland I organized the first bridge event which saw only one side painted by mode 2 keen stylo and prime from London. There were several pieces painted on the other side by Scottish and Irish artists at the same time. 1995 was the first year we painted both sides of the bridge and this has pretty much been the model ever since with both walls getting painted at the same time as well as the side wall. Over the past 15 years we have been honoured to have some of the top international artists grace our wall alongside some of the innovators from New York and a very large percentage of all the writers from Ireland making the bridge now the longest running annual graff event in the world. As a crew, we work hard each year to produce quality artwork and good vibes and we are very proud of what we have achieved as TDA Klann. Posted by Irish Street Art in International Street Art, Ireland, Irish Graffiti. Enjoy this video documenting Dublin’s incredible Hip-hop gathering last Easter. Filmed by Appolonia this short features graffiti, b-boying and, emceeing. Check out Terrible T-Kid 170 (graffiti artist from the Bronx) and The Blues Brothers (b-boy group). Posted by Irish Street Art in Featured Street Artist, International Street Art, Ireland. Its fair to see he is the most well rounded graffiti artist at work in ireland today with a capacity to do everything from quickly executed simple pieces to full colour work , characters and full scale cooperative projects with themed backgrounds and concepts. Since 1995 he’s treated the world as his canvas leaving behind some of his artwork in London, Germany, Copenhagen, Holland, Belgium, Spain and Sweden as well as making a visit to New York the birth place of his beloved artform. Maser has also painted extensively throughout Ireland. In between he studied fine art and then qualified with a distinction in Design Communication. Upon graduation Maser was awarded Membership of the International Society of Typographic Designers. Using what he learned in college and adapting it to meet his needs has given Maser‘s work a unique edge fusing graffiti and grapic design. Maser is a member of the TDA Klann and the Foes Crew. The TDA Klann, formed in 1991 are Ireland’s premier graffiti crew. Their focus on creating unique writing styles has earned them international acclaim and respect. Since 1993, they’ve been running Ireland’s first and only annual graffiti festival and front a movement for emerging artists encouraging and assisiting up and coming artists and promoting graffiti in a positive light. Maser endeavours to highlight the positive aspects of graffiti, how it can enrich the cityscape and provide an outlet for young artists. His style is reflective of this, being both uplifting and socially conscious and harmonious with the surfaces he uses. His work carries a message , from the simple Maser loves you to the eye love my city which is maser proclaiming to everyone his love for his city, his environment and the people that live there. He is currently working on a book documenting the relationship between Graffiti and social groups in Dublin City. Check out this quick clip on Maser of the TDA clann as he speaks of inspirations and his pop art ifluences.